Ancient Mayan temples set in the midst of a lush jungle . . . visiting a sacred site at the end of a 5000 year cycle . . . all the while surrounded by a surprising variety of birds and wildlife. What more could we ask for? 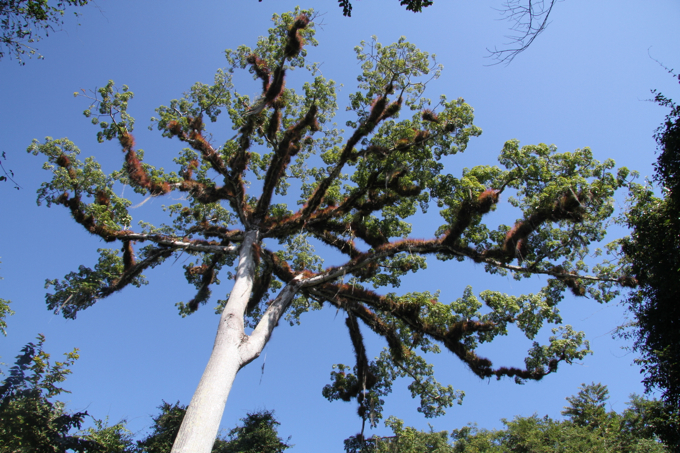 The Ceiba tree was considered sacred to the Mayans. The first thing that struck us about Tikal is just how big the archaeological site is. Spread over 16 square kilometers, archaeologists have mapped over 4000 structures to date, most of which remain covered by jungle. The only way to see the park is on foot. There is a large network of walking trails. Some are main paths that lead directly to the major temples, while other narrow trails meander through the jungle, allowing you to choose your own adventure as you explore. It was hard not to feel like Indiana Jones, as we turned a corner and caught our first glimpse of a lofty Mayan temple emerging above the canopy. Along the way we were observed by spider monkeys as they showed off their aerial skills, swinging from limb to limb or hanging by their tails as they gathered food. We certainly got a healthy work out each time we ventured in, logging over 10 kilometers to see the primary sites. 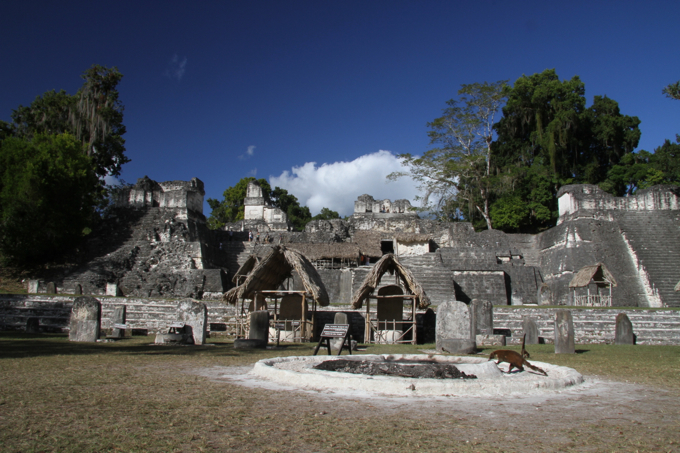 The Jaguar Temple is a Guatemalan icon. The Grand Plaza is the heart of Tikal with the famous Jaguar Temple looming high above a central plaza lined with a burial ground for kings, administrative buildings and the equally impressive Temple II facing it. We were there on December 23, and we could still see the smoldering ashes of a ceremonial fire used by the local Mayan people to celebrate the Bak’tun. Contrary to popular media, the Bak’tun does not represent an apocalypse but instead the end of a Great Cycle in the Mayan calendar and the beginning of a new era. Nonetheless, we counted ourselves fortunate to be visiting such an important site at this auspicious time. Frankly, we counted ourselves lucky to have survived. Check out this not-embarrassing-at-all video below to see what we mean! 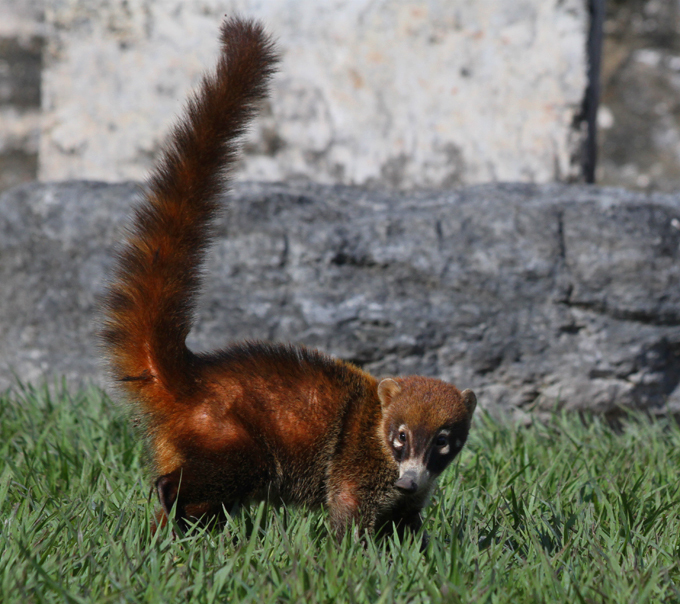 To add to the ambience, we were amused by a troop of koati mundi (related to anteaters, but looking like red pandas) with their bushy tails held straight up in the air as they foraged on the ground. A flock of ocellated turkeys with their multi-colored feathers also passed through oblivious to our presence. 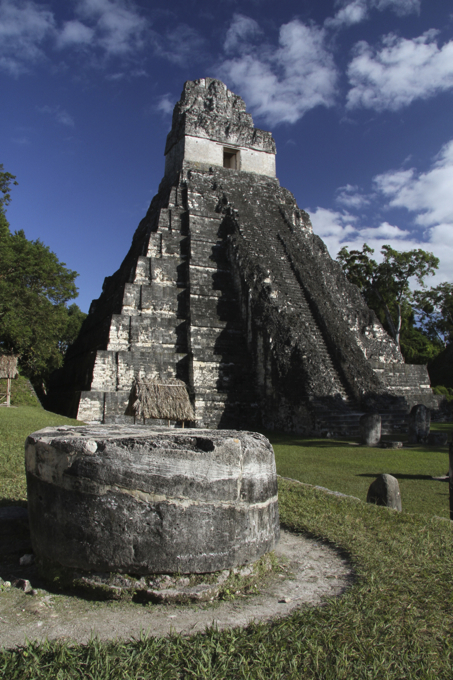 The Grand Plaza is the heart of Tikal. Check out the roaming koati mundi! 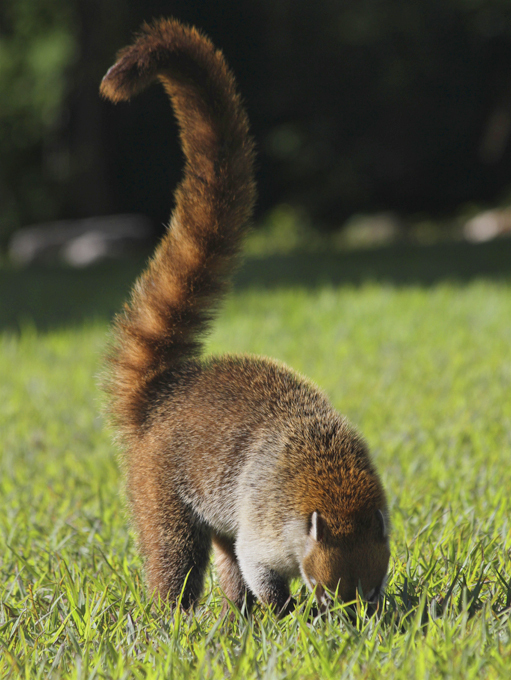 The koati mundi forages constantly, making it difficult to get a good shot. Gotcha! This cutie finally came up for a breath. 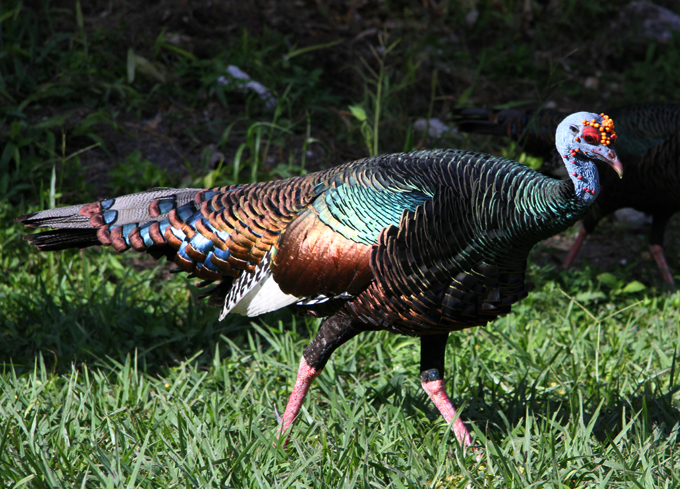 The ocellated turkey has much brighter feathers than its North American counterpart. At the far end of the complex lies Temple IV, the largest of the structures at Tikal. A healthy climb up a wooden staircase brought us above the tree canopy to an impressive panorama. From here, we could see several tops of temples peeking above the trees and the expanse of the jungle surrounding us. It’s no wonder that this site was not discovered by archaeologists until the mid-1850’s. Do you recognize the Rebel base? Star Wars geeks unite! Another captivating site was El Mundo Perdido (The Lost World), where a complex of buildings of various styles are all set together in one small area. This is also one of the few structures where we were allowed to climb to the stone steps to the top. In recent years, other temples have been closed due to a string of tourist fatalities. The steps are very steep and often slippery! We really enjoyed this small corner of Tikal that truly felt like a lost world. While the buildings were impressive, it was the spine-tingling sound of a howler monkey broadcasting his displeasure for all of Guatemala to hear that really caught our attention. You can listen for yourself here, but be forewarned that doing so might induce nightmares! 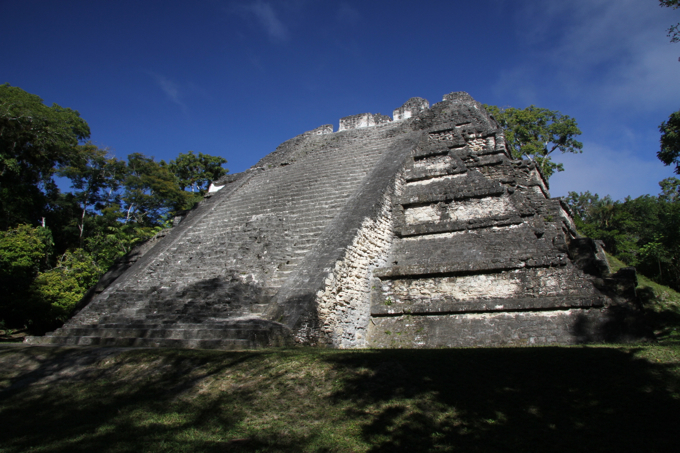 El Mundo Perdido is one of temples whose steps you can still climb…if you dare! 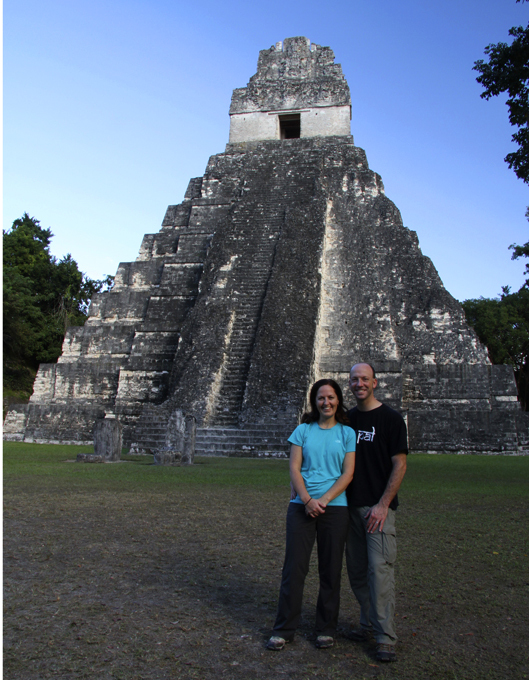 Having explored twice before and gotten a feel for Tikal on our own, we joined a guided tour for our final foray into the park. Our guide was born at Tikal before the government proclaimed it a national park and moved the villagers out, so his pride in his cultural heritage was evident in the enthusiasm he displayed. Not only did his interpretation bring life to the stone monuments, but he also spotted and identified several bird species we would never have seen otherwise, including toucans and aricari. As an added bonus, our guide led us into a current archaeological site where wall paintings of Mayan figures have recently been discovered. Access was via a 20 foot vertical ladder that led down to a spider-infested tunnel that was only about 3 feet tall–highly undesirable for arachnophobes and claustrophobes alike! Ladders, spiders and rats…oh my! Travel Logistics: We caught an overnight bus from Guate to Flores on Línea Dorada. It was comfortable, but freezing due to the AC. Still, on a short trip like this, it saved us a day’s travel and a night of accommodation for a minimum of pain. The bus drops you on charming Flores island where a slew of shuttle operators happily await your arrival and will transport you to the site of Tikal for Q100 round-trip, about an hour’s drive. This is an open ticket that allows you to return on any day with the same company at a variety of different times. One downside is that you are forced to buy an entry ticket to Tikal as you pass the first guard gate. Since we were staying at the Jungle Lodge, conveniently located next to the site entrance at Tikal, we wanted to relax for the day and delay our entry until after 3:30 p.m. when the guards will stamp your ticket for the following day, thus saving you $20/person entry fee for a second day. Perhaps if our Spanish were better we could have explained our intentions more clearly. As it turned out, we paid our fee, relaxed the following morning and then purchased a second ticket, allowing us to visit a second and third time (the third morning) for only one additional fee. The main benefit of staying at the Jungle Lodge, a pleasant oasis in itself, is that it affords you access to the park at dawn and dusk, well before and after most day-trippers. There are several comedors on-site, offering typical Guatemalan fare at slightly cheaper prices than the hotel restaurants. Flores or El Remate are good places to stay if you are only planning on visiting Tikal as a day trip. 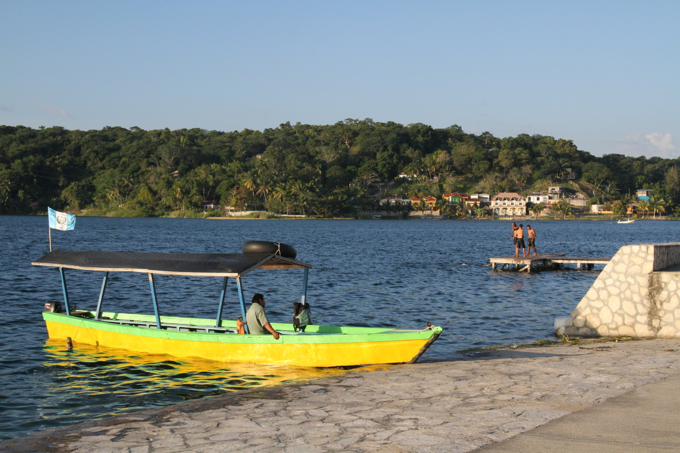 Located an hour from Tikal, the island town of Flores is a pleasant place to stay when visiting Tikal. We’re still here…take that, Mayans! Yes. You are still here! I love the videos. The first one is so well done. I’ll need to set aside some time to watch the rest. You should split each one into a separate post. Good job. Thanks, Chris! I am glad that you found the videos and enjoyed them. This is the first time that we have included any in a post, and they did not seem to show up in the email version. Any suggestions on how to deal with that? I don’t know how to make sure videos are included. But I’ve been dealing with a similar thing. I actually don’t want people to read the posts in the email. I want them to come to my site. If you add a “read more” tag to your post after the first couple of sentences, then the email will only have the first couple sentences with a link to open the actual article on your site. Then people will be more likely to see your other posts as well. Thanks for the tip, Chris. That’s a really good idea. Another excellent post… I love the videos, but really, for me, they’re not complete unless Matt describes his clothing! Too funny! At some point it would be nice to go back and add those Patagonia videos to this site. If there were only 26 hours in the day, right? Thank you for reading. Simply awesome. I don’t understand why Alison didn’t go down with the spiders and the rats? I have been meaning to tell you about that…the spiders were Costa Rican-sized! You can barely make out the huge body of one on the wall as Matt is going down the ladder. Yikes! We saw a koati mundi crossing the road in Sedona, it was a very strange looking animal! This blog is great! Thank you, Donna. I had no idea that they could be found in the US. It was the first time that we had ever seen one. We just wished that they would look up every once in a while for a photo! 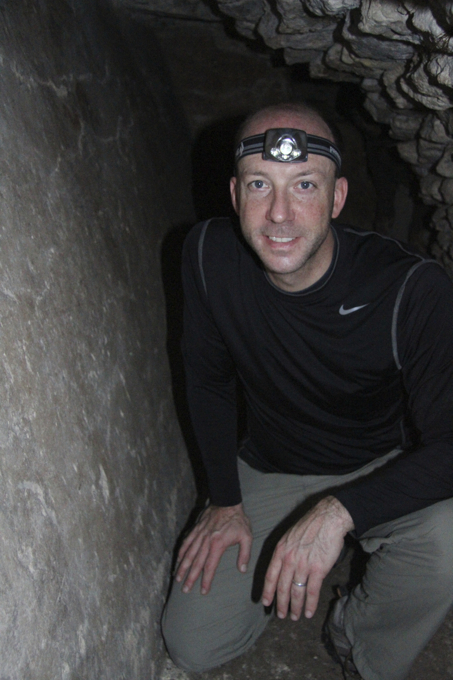 Well, now I know what I won’t be doing whenever I make it to Tikal–going down that tunnel! Eeeks! You guys went on an awesome trip, and I loved your many videos of your adventures, especially the one about the end of the Mayan calendar. It sounds like you were lucky to have made it out alive! Awesome post. I just visited Guatemala myself, but NOT this region unfortunately. I did, however, write a blog on the subject of coffee and social inequality. You guys do great work and I think the video that I viewed enhanced the experience for me. I tried to like the video apart from the application playing it, but it wouldn’t let me do that. Keep up the good work, I look forward to visiting more often. Thank you for visiting our blog and taking the time to comment on our posts. We really appreciate it! It is always interesting to read different perspectives on places that you have been or hope to visit, and we enjoyed your entry about social inequality in Guatemala. It sounds like Guatemala is a place that speaks to you, so we have a feeling that you will be back some day. 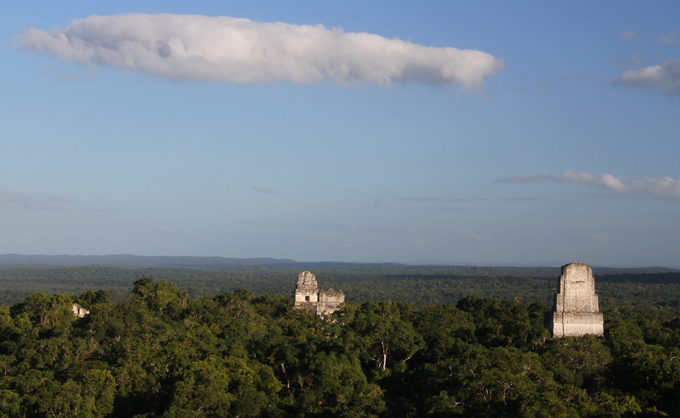 Hopefully, a trip north to Tikal is in your future. Cheers! A trip to Tikal is definitely in my future and I’m sure I will be back to Guatemala several more times. As beautiful as the landscape is, I think the people are even more wonderful. Also, thanks for checking out my article.